What is an Empirical Cumulative Distribution Function? An empirical cumulative distribution function (CDF) is a non-parametric estimator of the underlying CDF of a random variable. It assigns a probability of to each datum, orders the data from smallest to largest in value, and calculates the sum of the assigned probabilities up to and including each datum. The result is a step function that increases by at each datum. is the indicator function. It has 2 possible values: 1 if the event inside the brackets occurs, and 0 if not. 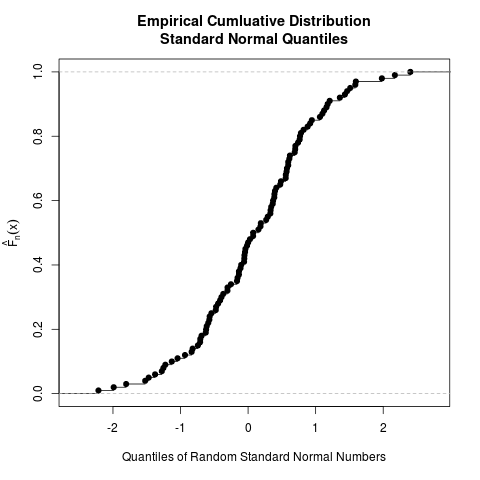 Why is the Empirical Cumulative Distribution Useful in Exploratory Data Analysis? Some appealing properties of the empirical CDF can be obtained from mathematical statistics. is also an unbiased estimator of . Thus, for a fixed , has a lower variance than . 3) By the Glivenko-Cantelli theorem, is a consistent estimator of . In fact, converges uniformly to . Here is the code for generating the plot of the empirical CDF of the random standard normal numbers; the plot is given again after the code. For the sake of brevity, I will describe in detail how to generate this and other plots of empirical CDFs in a separate post; in fact, I will show 2 different ways of doing so in R! what if there is a difference between the empirical and the normal? Thank you for sharing this monograph with us. Could you please tell us what you would like to convey by posting it? Yes, sorry for the terse response. A complaint I often have about people presenting results with empirical distribution functions is that they believe that, given the sample, the EDF is the definitive EDF, a good approximation to the “true CDF” of the distribution. In fact, the EDF is a random variable just like any other statistic and, so, it is subject to variability. One of the things this implies is if two processes are plotted on the same graph, both represented by EDFs, it is generally not a simple matter to determine if one is “better than” another. In fact, that is an inference and a decision in itself. While I prefer a Bayesian approach to the question, I have not found much written up on determining whether or not one EDF curve is strictly stochastically greater than another. The paper by Uusitalo made a beginning at this, although not from a Bayesian perspective but, rather, than of extreme values. They used to have a package available in R’s CRAN. Good point, Jan. I hope that I have not given the impression that the ECDF is a definitively good approximation of the CDF in my blog post; if I have, please do tell me how I can remove that confusion. I am not familiar with inferences on ECDFs, including comparisons between 2 ECDFs. I welcome anyone to share information about this, both from a frequentist persective and a Bayesian perspective. I aim to expand my series on exploratory data analysis to cover multivariate data. Please stay tuned! The troubles in practice are often more in perception and conceptual than theoretical. I’m working with a customer today who is comparing performance of several processes and was doing it using ECDFs. Up to the 0.8 quantile, their preferred process is kicking the rest of them all over the field, but it turns out it does REALLY BADLY on the remaining 0.2, putting it in 3rd place. The Bayesian posterior shows that, since the probability mass gets put up into that long tail, and, so, has less at better regions of performance. But if you look at the lower portion, it looks wonderful. Thanks for breaking down the ECDF for us. Is there a way to extract the x,y vectors from ecdf() in R? I’ve run it with a large vector of data (~10,000 values) and see that it creates an ecfd with about 150 points. I’d like to extract those point and compare them with other representations of the CDF. I spent some time researching this, and I cannot find a way to extract the quantiles and the ECDF values from ecdf(). However, in a follow-up blog post, I demonstrated a way to build your own ECDF using rudimentary functions in R. Scroll down to Method #2 in the following post.